William Hill has partnered with Mastercard and just launched a new pre-paid card which allows punters to instantly access their winnings – a first for the betting industry. 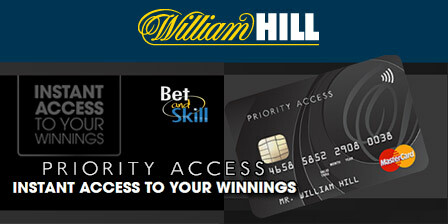 Find here all the features and how to get a William Hill Priority Access Card. What is William Hill Priority Access Card? You no longer have to wait to enjoy your winnings. No more delays, no more winnings being caught up in day to day banking. It removes the mandatory three to five-day wait you currently experience when withdrawing money from their William Hill accounts. To use the William Hill Priority Access Prepaid MasterCard you simply need to have a positive balance in your William Hill online account. With your exclusive Priority Access Prepaid MasterCard from William Hill, you can use the money from your William Hill online account in any way you choose, in an instant. This is a prepaid MasterCard ­ so no levels of credit will be permitted. You can use your William Hill Priority Access Prepaid MasterCard to shop online, withdraw at ATMs/cash machine, spend on the high-street, treat your family and friends to a meal or even use abroad. The Priority Access Card is contactless, which means users can make payments up to £30 simply by tapping the card on a reader without entering a PIN. The ‘Priority Access’ card was rewarded as best Innovation of the Year at the eGaming Review Marketing and Innovation Awards held earlier this year. Jamie Hart, director of innovation and customer experience at William Hill, said: “The problem for customers is that winning money online is not always as much fun as winning cash at the races where you can collect and spend winnings straight away. The William Hill Priority Access Card changes the entire betting experience by finally offer our customers the same instant payout experience as its retail services”. “We have seen an extremely positive reaction to the card so far in pilot and are excited about the possibilities created by wider customer adoption”. How to get a Priority Access Card? Don't forget you have to contact William Hill support or be invited to apply for a Priority Access card. "William Hill launch Priority Access Card - winnings instantly credited on your prepaid Mastercard"